People assign hot dogs the title of "America's food," but I beg to differ. For me, it's a burger. It's the first thing I want to eat when I return from a trip out of the country. While burgers are not something I traditionally crave, it seems to be the only thing that can hit the spot when I'm back in the good ole USA. Having just returned from a trip to Europe, I've had burgers on my brain ever since I passed through customs. However, a trip through the McDonald's drive-through is not exactly what I had in mind. I wanted a proper, homemade burger. Not a ladylike one, but one all juicy and messy, requiring a dozen napkins and possibly a shower afterwards. I'd cleaned out my refrigerator before I left, so there was nothing in it except condiments. Since one cannot live on mustard alone, I made the trek to the Farmers Market yesterday. Of course I was delighted to see a bounty of vibrant vegetables and made sure to pick up a pound of peaches while they're still around. As I walked through row after row, I found myself increasingly distracted. There was this intoxicating aroma seducing me. At Farmers, my olfactory system is usually enticed by fragrant dried lavender, notes of citrus, and the earthiness of root vegetables. But this time, there was a note of sweet onions, punctuated by grilled meat and possibly bacon. I mean, Lord have mercy, is there a combination more compelling when you're hungry and feeling grateful to be back home? But this was definitely a very non-Farmer's scent which left me feeling disoriented. I was in Santa Barbara after all, which is not known as the mecca of meat, but it was unmistakeable. A burger. Someone was grilling a burger. I found myself weaving through the rows with increasing speed to find the source of this intoxicating scent. And just on the outskirts of the market was the Burger Bus. They've created a cult following in Santa Barbara. I had yet to partake in their "simple yet sublime" burgers though. The scent emanating from the bus (which is literally a refurbished school bus — a short one at that!) has magnetic power. I was like Wimpy from Popeye's cartoons, who was often seen walking like a zombie in pursuit of a burger, the scent leading him like a leash. I literally walked up to place my order and realized in shock and horror that I'd just spent my last dollar on a half-gallon of organic, fresh-squeezed orange juice from Ojai. 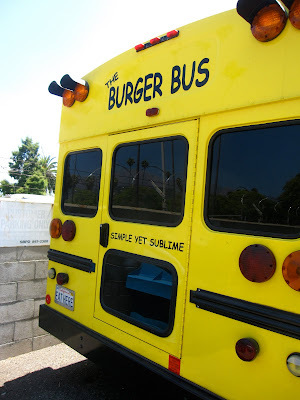 No diss to the Burger Bus, but they didn't accepted credit cards. There was no way I was going to walk away from that bus without a burger. "Excuse me, sir. Is there an ATM here in the Market?" "Well, you can buy a gift card here that any vendor in the market will accept as cash." "Umm, yeah. But I would actually prefer the cash." "Oh, don't worry. Each vendor will happily take this card. It's just like cash for them." "Well, you see, err, I, umm, I'm not planning to use the money in the Market. I don't want to buy any organic, homegrown, nutritious vegetables. I actually want to walk across the street and buy a big, fattening, mouth-watering burger that's been teasing me for the past 30 minutes and has lead me to wonder how anyone can ever be a vegetarian." The poor guy was obviously taken aback but did kindly point me in the direction of the ATM, after which I was finally able to place my order at the Burger Bus. The burger was delectable and definitely worth the wait. This post is long enough already so I'll spare you the details of the burger other than it was *awesome* (imagine me saying that in a very sing-songy manner which is what I do if something is mind-blowingly good), but it did get me thinking about how amazing burgers can be. Burgers are my mom's favorite meal. It's what she wants my dad to cook for her on her birthday. I have to agree: It's hard to beat a homemade burger. But sometimes we have to substitute the "homemade" part for a purchased one. No offense to my dad's barbecuing, because he's a master, but some of the other options are downright good. Case in point, the Burger Bus. I have never thought to put a burger on a ciabatta roll [right now I know my Southern friends are cracking up over that detail], but let me just say you shouldn't knock it unless you've tried it, especially if it's homemade from Our Daily Bread and completely light and pillowy. [Having just said that, you'll never catch me eating a burger on an English muffin. That's just wrong.] I've also never thought to put jalapeño jelly on it, but will do so again because it's so dang tasty, sublime even. Another amazing burger I've had was at Pirate's Cove in Josephine, AL, not far from my grandmother's. This burger, swabbed in a drippy and delicious gin-mustard sauce, has been named by Garden & Gun as one of the 100 Southern foods you must try before you die. If that isn't a compelling accolade, I don't know what is. Last time I was there was over Thanksgiving. It was "off-season," so definitely mellow there, which was a welcome change of pace from the bustle of the summer boating season. It's one of those joints where you're gonna drink out of plastic cups, may not find toilet paper in the bathroom, but will most certainly find oodles of drunk wisdom graffitied on every available surface. My recent favorite was, "Why am I so thirsty this morning when I drank so much last night?" Amen to that! But what if you can't find the Burger Bus or can't make the trek to Josephine, AL? Are there other acceptable substitutes? In California, In-N-Out Burger definitely gets top rating. Almost as cultish as the Burger Bus, people covet this fast-food burger, which, to their credit, is very un-fast-food-esque. It's the closest thing you'll ever get to a homemade burger from a drive-thru. They keep it simple and focused: Burgers, fries, and shakes from the freshest, highest quality ingredients available. And did I mention how nice they are there? It's like a little shot of Southern hospitality and always makes me feel closer to home. There are quality burgers and then there are quality burgers on the fly. For me, no one holds a candle to the South's Krystal Burgers. Their tagline is "Nothin' Like It" and I have to agree. Is it the best burger I've ever had? No, but it's the one that is associated with more life moments that I cherish and would never trade. Whether that is eating with my dad and his parents at "Crishtals" or grabbing a 12-pack (of burgers, that is) with friends as the early morning sun rises after a late night out on the town (Bill and Terry, you know what I'm talking about). There is something addictive about this tiny slider crafted simply from a steamed bun, French's mustard, grilled onions, crisp pickle, and grilled beef patty. It may seem pedestrian but it does something good to your soul. I will often fly from Santa Barbara to New Orleans for the holidays and then drive to my grandmother's house in Bay Minette, AL. Even though I land beyond starved after traveling all day and consuming a tiny bag of pretzels, I joyfully hop into my rental car, bypass the Cajun culinary calling (which is not easy to do! ), and drive the three hours until I reach Exit 13 on I-65. Granted it's only minutes from my grandmother's house, where delicious food gluttony awaits, yet I find myself unable to resist the pull of Krystals. I simply must stop for at least 2 squares. That's my rationale at least. Two Krystal's can't ruin your appetite, can it? The truth of the matter is it can, but when you've got Monk's cooking awaiting you, you make room!